The Z-Blade is one of a kind. This multi-purpose cutting tool is a #60 stainless steel scalpel blade with an over-molded plastic handle that's easy to hold and protects the thin scalpel blade from breakage. Weighing less than one ounce, this simple knife keeps your pack light, and your edge sharp. Field dress a whole elk with two blades and never have to sharpen! Sharpening and replacing blades in the field creates unnecessary hazards. Be safe! Use the Z-Blade. Then after you've harvested your animal, toss the Z-Blade in your dishwasher and keep it in your tool kit for other jobs. You'll be amazed how many unexpected uses you find for this unique tool. Two Z-Blades. Choose your color. 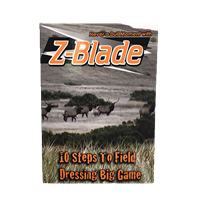 Instructional DVD on how to use the Z-Blade for field dressing big game. Viewer discretion advised. 100 Z-Blades with counter top display. Choose your color. The Z-Blade is injection molded right here in the USA! The mold was designed by the owners of PFI, Inc. who are avid hunters and outdoorsmen. They saw the need for a safer, sharper field knife, and so they created a solution. Though designed for field dressing, a joke amongst the team at PFI Inc. developed that there are 1001 uses for the Z-Blade... and still we keep finding more! Here are some pictures of the Z-Blade molds, also manufactured in the USA. The picture above shows the mold that makes the knives. Four knives are molded with a single shot! Two inserts allow machine operators to insert four blades into the mold (see picture below). Then, the mold closes and plastic is injected, forming the blade handles. "Now that's a knife!" The Z-Blade is a tool you can use. The stainless steel scalpel blade remains sharper than most kitchen knives, even when put to the most difficult tasks. It is so thin and slim that it can fit in very difficult to reach places. This knife can cut anything! It can cut garden hoses, loose threads, layers of duck tape, fabrics, paper even, plastic packaging, cardboard, the hides of big animals like elk and moose, you name it! And, the Z-Blade's locking cap makes it exceptionally safe and easy to store! This is the key thing with razor sharp knives: you don't want to cut yourself! The Z-Blade also has a little knob on the handle, which doubles as part of the cap's locking mechanism, to prevent your finger from slipping onto the blade. Every aspect of the Z-Blade was thoughtfully designed for functionality and safety. Get one for yourself and find out what's it's like to never live a dull moment again!